Sector combines occupancy detection, daylight harvesting and dimming control technologies into an integrated system. Sector enables installers to wire all system components and accessories using the same wiring topology. 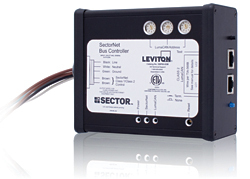 All components are on a single bus, and accessories connect to the network, not the ballast. The system enables faster, easier system design and programming through its drag-and-drop software interface.